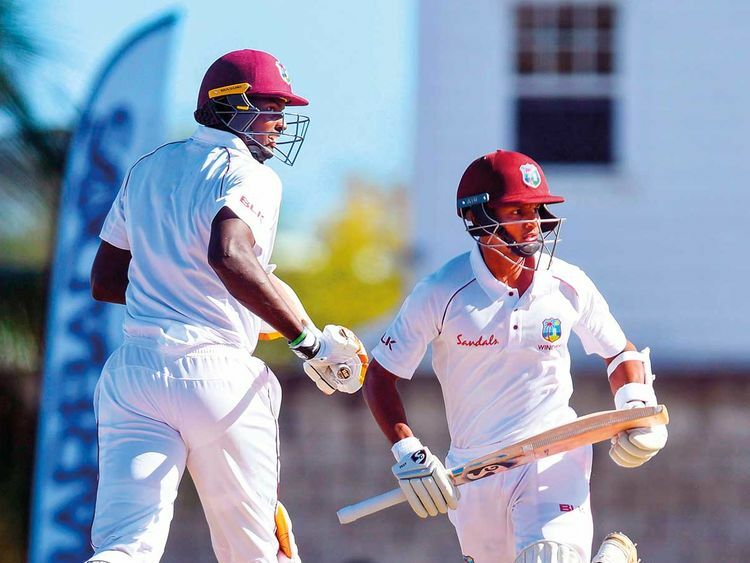 Barbados: West Indies captain Jason Holder and wicketkeeper Shane Dowrich recorded the highest unbeaten seventh-wicket partnership in Test history as the hosts put England on the ropes in an extraordinary first Test in Barbados on Friday. England, set a massive target of 628 in their second innings, were 56 without loss at stumps on day three, a tidy start but still facing the daunting prospect of surviving two more days in Bridgetown. After 18 wickets fell on Thursday, there were none on Friday in a remarkable turnaround of fortunes for both teams on a Kensington Oval pitch that did not seem to have changed much overnight. Holder etched his name into the record books with an unbeaten double century before declaring his team’s second innings at 415 for six wickets after tea. His 202 not out, achieved at the healthy clip not far short of a run a ball, was the third highest by a number eight in Test history, behind only the Pakistan duo of Wasim Akram (257 not out) and Imtiaz Ahmad (209). Holder and Dowrich, who made a more patient century with an innings of 116, put on an unbeaten seventh-wicket partnership of 295 at Kensington Oval in Bridgetown. Their stand was the third highest for a seventh wicket in test history, and also surpassed the previous record for an unbeaten partnership, 259, set by V.V.S. Laxman and Mahendra Singh Dhoni of India against South Africa in 2010. Holder prolonged England’s agony in the field by delaying his declaration beyond what was necessary, perhaps in an effort to completely demoralise the visitors. But England openers Rory Burns (39) and Keaton Jennings (11) survived 20 overs without many problems until stumps, though Burns must have had his heart in his mouth when he survived a vociferous lbw appeal by Alzarri Joseph in the third-last over. Holder decided not to review it, a good decision as a replay showed the ball had pitched outside leg stump. England’s untroubled start to the second innings was in stark contrast to their 77 all out in their first innings, the lowest ever test total by any team at Kensington Oval. Yet, the tourists still had an outside shot at victory when they reduced West Indies to 61 for five late on the second day. But that was before Dowrich and Shimron Hetmyer (31) put together a half-century partnership, before Holder and Dowrich took the match completely out of England’s reach. England pace bowler James Anderson collected five wickets in the first innings, but toiled without success in the second (0-58), while off-spinner Moeen Ali had the best figures, 3-78. He instigated the Thursday collapse, but could not add to his haul on Friday. England captain Joe Root showed little faith in leg-spinner Adil Rashid, who came in for severe punishment, particularly by Holder. He had 0-61 off nine overs, while Root was more economical with 0-37 off 10 overs.